The two part finale of Buddy Complex television series deals with the final battle between the Free Treaty Alliance and the space division of Zogiria, lead by an elderly Bizon, as Earth and time itself hang in the balance. Follows directly after the events of Buddy Complex and kinda ties up all the unanswered questions but at the same time creates some new ones. Anytime you deal with time travel, you are gonna be left scratching your head to a certain extent. The story is rushed quite a bit, the second episode, is basically a clip real going through all the time loops to piece everything together in a matter of minutes, something that should have been given an entire two parter by itself. A mistake that they made was introducing some new elements like Aoba being a senpai so a new pilot and new coupling system. You only have two episodes, finish what you started people. And there is one thing that was present in the first series that struck me even more here is the body count. A LOT of people die and good guys bad guys, Aoba and his crew killing people, and in my opinion not enough attention is put on that. Aoba is a kid straight out of highschool, he should be struggling with the fact that he kills people on a consistent basis. There is a part in this were half the fleet and an entire base in obliterated and all they do is gasp. That was almost 1000 people that just died. But they ignore it, which bothers me, but i still like the show despite it. I liked it just because i like Buddy Complex and i liked seeing the characters again, but overall it's pretty meh with a hint of disappointment. In the end it's a kind of special that you just gotta watch to get a bit of closure. I have been a Gundam fan ever since I saw Wing on the television way back in my childhood. 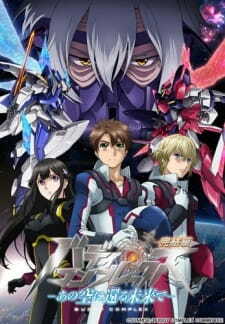 From then, I tried to follow every mecha anime Sunrise did. Buddy Complex spells zero Gundam, their mecha inclusion was something more advance or let's just say, it's more robot-ic than gundam-ic. I saw Buddy Complex back in April. After I completed it, I was kinda looking forward as to how they will wrap the title. With early news of a sequel, my hype went up hoping it will have another 1 cour however... it turned out to be a 2 part OVA. But still, it wasn't enough to lower my anticipation. Now, the judgment begins and I hope I can be as clear and transparent to how I saw the series. The story was indeed a direct sequel. Straight from the final episode's twist, Hina changed sides and deflect to the Confed. Hoping to find her lost memories, she sided to the good side without any good reason, but to be with the main protagonist. Could it be love? Of course it is. Buddy Complex is that kind of show, mate. Then, apparently, news of having an ultra-mega-hyper JUNON canon was detected up space. A realm buddy complex failed to introduced in the prequel or should I say, saved for this 2 part OVA. Now, the usual Sunrise robot action is finally revealed. Going against the ultra-mega-hyper JUNON canon, like the usual Sunrise formula, the good side was ambushed, despaired and nearly obliterated only for the heroes to find another miracle. I've been already liberated from this type of hero-prevails-everything type of show and sad to say, I find Buddy Complex Final Act, a mediocre finale. Sound and art is fine as it is. It's still the same old songs and the usual art consistency. I didn't bother taking a quick peek to its prequel to compare the robot designs. So I guess, art and sound gets a good rating, eh? For characters... 2 episodes... Well, since the prequel shows a direct relation to this, it's just safe to include the judgment for characters in a 15 episode criteria. Sad to say, I've grown tired of goody-two-shoes type of heroes. But I wouldn't say I dislike Aoba. He's okay, alright. Dio's the same as well. Hina's cute, but she's not really a good watch. The supporting cast, (excluding the magnificent villain professor and main villain) is dull as well. Now, as far as I'm concerned, the reason I kept enduring the bland 2 episodes was because of the villains, most especially the villain professor. This will be quite a biased point of view since I really like Koyasu Takehito so much, that I have most of his shows on my hard-drive. Whether it be a hero role or a villain role, I always try to be enthusiastic and always look forward to his character realization. Same goes to Sakurai Takahiro. With all honesty, I don't like Sakurai Takahiro as a protagonist. His talents are all for the bad and weird lots or for girly shows. Never did I like most of his characters especially his Kururugi Suzaku, in fact, I hate the guts of this character. Well back to the character, Bizon, who is driven by revenge due to Hina choosing another boyfriend rather than him, poses the ultimate threat to the world by posing as a high-political figure or something like that. As the story goes, he conspired again, with the mad scientist on the bad side faction and alas, they almost turned the battlefield according to their scenarios. But that could be well proven wrong by the good side. With terminologies like nanoseconds and whatever scientific related, I frankly giggled since I find it too funny. Now, with regards to the fight, we already know how Sunrise finishes the bad guys. Formula states that the bad guys will be beaten in a robot fight and boom... justice prevails. Excluding the fact that the main heroes coupling are overpowered. I don't really find anything worth noticing. Now, it all ends with Aoba and Hina going back to their own time. Leaving Dio and the other goody-two-shoes characters. Concluding, BuddyCom Final Act might sound a little cool at first but don't get deceived. All it features was additional running time and nothing else. The twist they included to explain Hina's involvement was far from clever and it's one that you can just ignore in exchange for the special effects.